Today both Caitlin and Tom had major roles to play in the school’s ANZAC assembly (and I had a little role of my own too*). 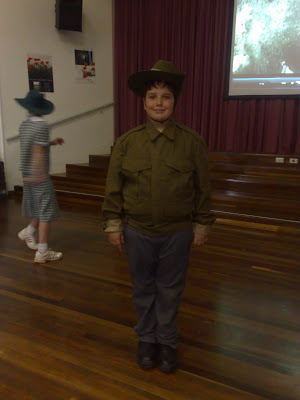 Tom’s class was running the assembly, there was a short video about World War 1 and the ANZACs and then some of the kids gave a presentation. Tom got to dress up as a soldier and tell part of the story of the Gallipoli landing and the meaning of ANZAC day. He did really well, speaking clearly and confidently with lots of expression. Proud mum was proud. They then sang “One Day” for which, because when rehearsals were under way it was apparently decided that the verses were a little too difficult for the kids to sing, the teachers invited Caitlin to sing the verses solo with the rest of the kids joining in for the choruses. So she did. Proud mum was proud again. The video of Tom talking was not a great success but the one of Caitlin singing is ok, the camera ran out of memory just before the end and the quality isn’t great as Adam was sitting way up the back of the hall but here it is anyway. Tom was wearing Adam’s old slouch hat (he used to be in the Army Reserve) because when I arrived he had on a way too small slouch hat which made him look utterly ludicrous. Unfortunately Adam’s lacked a chin strap and kept slipping back when Tom was signing the words of the song. This photo doesn’t quite do justice, the too small hat was perched on the very top of his head. Turned out to be a bit of a family affair all round in the end. * I was the parent representative placing a poppy on the wreath. Well done Caitlin and Tom. I wish I had been in the audience!! She's got a lovely voice. And didn't she do well!! Caitlin has a beautiful voice. Well done Caitlin and Tom! Caitlin has a lovely voice. Talented kids you've got there. Because you needed me to point that out. Big beautiful voice with lovely timbre. I like your proud mum role. You have lots to be proud of. Oh you should be so proud.